A MacGuffin or the key to the crime? It is one of history’s great art heists. This October 16th, thieves broke into the Kunsthal Museum in Rotterdam, circumvented the high-tech security system and stole seven paintings during the wee hours before the museum opened on Tuesday morning. They got two paintings by Monet, a Picasso, a Matisse, a Gauguin, a Lucien Freud, and one painting by Meyer de Haan. In every great crime there is a clue. And the clue is often the element that doesn’t fit. In this case, the thing that doesn’t fit is the painting by Meyer de Haan. That’s the one that makes you stop and think. Meyer de Haan. Why would anyone stealing expensive paintings from a major museum steal a Meyer de Haan? The Meyer de Haan is a self-portrait by a minor artist most people have never heard of. It is worth only a fraction of what the other paintings are worth. 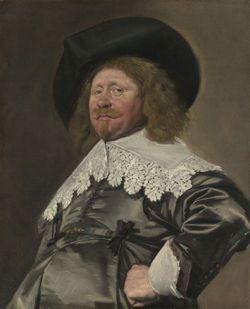 Jop Ubbens, the general director of Christie’s in Amsterdam told The Guardian that the de Haan “might have been stolen by mistake.” The Guardian’s art critic, Jonathan Jones, thinks “any idea that a tasteful collector commissioned this theft is undermined by the inclusion of Meyer de Haan’s “Self-Portrait”. No offence, but this comparatively minor Dutch artist does not really belong in the company of the others whose works have been stolen.” True. But suppose for a moment that it wasn’t a mistake. Suppose that whoever masterminded this robbery actually did want the Meyer de Haan. Why? What does the painting by Meyer de Haan tell us? What might that self-portrait have to do with all the other, more famous paintings that were stolen? There is a mystery here, perhaps, that only needs the right key for unlocking, the right set of questions. And the first, most obvious question is staring us right in the face. Who is Meyer de Haan? Meyer de Haan was a little Jewish man from Amsterdam. He stood about 4 foot eleven and he had a hunchback. This is all true. Meyer worked at his family bakery during the years he was learning to become a painter. This is in the 1870s. He was planning a great work. It was to be called “Uriël Acosta”, after the Portuguese philosopher Uriël de Costa, sometimes considered to be a pre-cursor to Baruch Spinoza. De Costa struggled against established religion throughout his life and, like Spinoza, was excommunicated by the Jewish community of Amsterdam and then, unlike Spinoza, eventually committed suicide. Gauguin liked de Haan, too. The two artists lived together in Brittany in the period just before Gauguin went off to Tahiti, where he would paint some of the most significant paintings of the era. 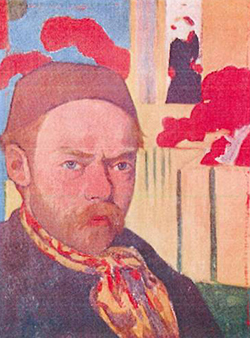 During the time they lived together, Gauguin also produced a number of portraits of de Haan. They are eerie and dark works. Gauguin made de Haan look like a devil, with pointy and menacing features. The art critic Hilton Kramer once noted that Gauguin painted de Haan as if he saw in him “something fierce, lascivious and animalistic.” Indeed Kramer goes further, suggesting that “the eyes and ears in these Gauguin portraits of de Haan are almost identical to those of the symbolic fox that presides over the pale body of the prostrate naked girl in Gauguin’s ‘The Loss of Virginity’ (1890-91).” That is to say, Gauguin’s portraits of de Haan were important in the early development of Symbolist painting. Gauguin was painting de Haan not as he actually looked, but as a symbol for the demonic forces of nature. Symbolism. That is the key. That is the clue we were looking for, the element that runs through all the paintings stolen from the museum in Rotterdam. If it were all about money, the theft of the Meyer de Haan makes no sense. And if the theft of the de Haan were simply a mistake, it was a mistake that was strangely consistent from an art historical perspective. 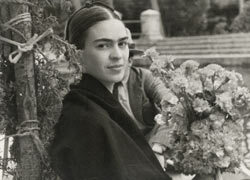 Each poet has his unique personality; each of his moments has its special tone, its special combination of elements. And it is the poet’s task to find, to invent, the special language which alone will be capable of expressing his personality and feelings. Such language must make use of symbols: what is so special, so fleeting and so vague cannot be conveyed by direct statement or description, but only by a succession of words, of images, which will serve to suggest it to the reader. Symbolism, in short, is another form of Romanticism. It is the attempt to express human experience as it is actually felt in the moment, without recourse to scientific explanation or to general laws. How does it feel to stand out in the morning sun on a brisk autumn day? A physicist can give many explanations about such a moment, can describe the material causes that make such a morning possible. But a Symbolist wants to try to convey the feeling itself, how it was for him, what such an experience meant for one unique human being on earth. 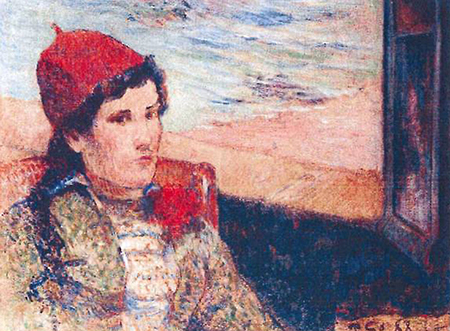 Take a look at those seven paintings stolen from the Rotterdam Museum again. The thread of Symbolism runs through them all. 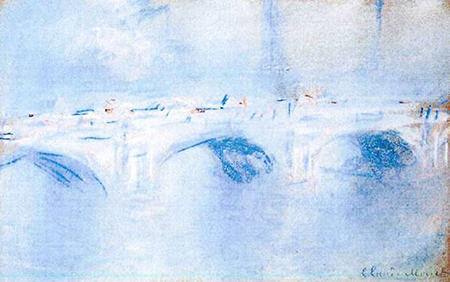 Those works by Monet (“Waterloo Bridge, London” and “Charing Cross Bridge, London”) are two of Monet’s most fleeting, most vague impressions of bridges. 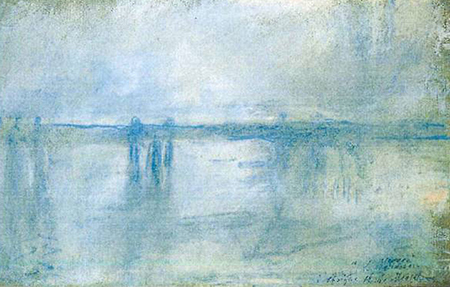 They are Monet, as a proto-Symbolist. The Gauguin that was stolen, “Girl in Front of Open Window,” is a Symbolist work, given that Gauguin considered himself a Symbolist throughout his career. But it shares something else with the other paintings stolen in the heist. The girl in front of the window has what you might call a “mysterious gaze.” Her head is tilted down and to the right. Her eyes meet the viewer, but not quite. The view outside her window looks like something Monet might have painted. Maybe it is Waterloo Bridge, Gauguin doesn’t paint enough detail for us to tell. It is not clear what the woman is looking at nor, more importantly, what she is thinking. This is a common aspect of Symbolist portraits. Symbolist portraiture conveys impenetrability. The subjects of the portrait are engaged in something private, and we the viewers happen upon that private experience without understanding it. 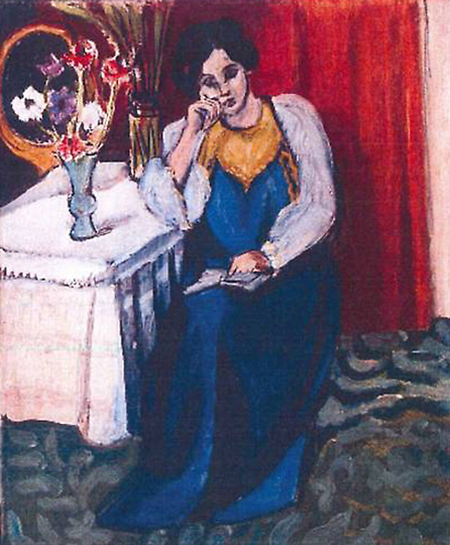 This is the same look we are getting from the woman in the Matisse painting that was stolen, “Reading Girl in White and Yellow.” The girl is reading. We do not know what she is reading. Actually, she isn’t even reading at the moment the painting captures her. She is reflecting on something she has read. She is twice removed, off on her own thoughts, caught in the midst of daydream. This is a painting painted by the same Matisse who once said, “I do not paint things, only the difference between things.” In short, a Symbolist. And what about that de Haan painting again? We know that history hasn’t favored de Haan as one of the great masters. But, then again, the Musee d’Orsay in Paris produced a show of de Haan’s work in 2010 titled Meyer de Haan: The Hidden Master. A few years before that, in a review of another show featuring work by de Haan, Hilton Kramer called de Haan’s “Self-Portrait” — the painting that was recently stolen — “one of his most beautifully painted pictures,” and complimented de Haan’s “remarkably successful attempts to paint in a Gauguinesque style.” The thieves of Rotterdam seem to agree. Yet the look on the face of Meyer de Haan in his self-portrait is more than just Gauguinesque. De Haan is just barely meeting our gaze. He is troubled and self-assured at the same time. Or you could say that he is both absent and present. He is just about to look away, to have another thought. Behind him are painted splotches of red and yellow, a kind of dreamscape. It is so very Symbolist. On the Picasso, we can return to Hilton Kramer. Writing about the relation between Gauguin, de Haan, and Picasso, Kramer wrote: “It has been suggested, by the way, that Gauguin’s distorted depiction of de Haan in [Gauguin’s] portraits may have exerted an important influence on the conception of the figures in Picasso’s “Les Desmoiselles d’Avignon” (1907), for there had been a huge retrospective of Gauguin’s work in Paris in 1906 which Picasso is known to have seen.” Of course, the Picasso stolen in Rotterdam, “Harlequin Head” was a late Picasso, painted in 1971. But Picasso toyed with Symbolist imagery and ideas throughout his career. 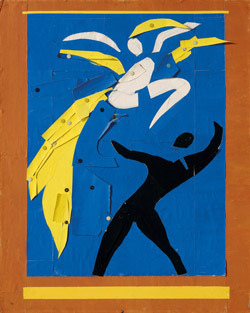 His late work often returned to the style and mood of the Symbolism of the early 20th century. “Harlequin Head” looks just like that — something Picasso might have painted had he run off with Gauguin instead of hanging around with Braque. The slightly misplaced facial features of the head are reminiscent of Picasso’s Cubism, but the effect of the portrait is different. 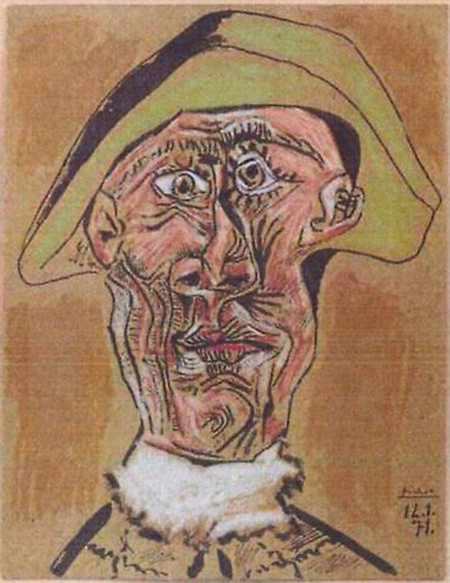 Is it going too far to say that Picasso’s “Harlequin Head” has the Symbolist gaze? At least we can say this: the harlequin figure was a favorite of Picasso. He used harlequins again and again in his painting. When Picasso wanted to gesture to the dark and mysterious forces in the world, he would paint the harlequin. Think of Picasso’s famous painting from 1905, “Au Lapin Agile,” where the harlequin drinks at a bar. The harlequin was one of his symbols. Just like what Gauguin was doing in his demonic portraits of Meyer de Haan. It is, in fact, not impossible that Picasso was influenced in his depiction of the harlequin by what he had witnessed in Gauguin’s paintings of de Haan. Maybe Picasso realized that Gauguin was making de Haan into a modern Symbolist-satyr and decided that he would do the same with his harlequin. Finally, the Lucien Freud. Freud is not often described as a Symbolist. But look at the painting that was stolen, “Woman with Eyes Closed.” It is a portrait of a woman against a gray background, maybe a sheet. She is calm, introspective. She could be praying. If I wanted to show the continuity between Gauguin, Matisse, and Freud along Symbolist lines this is exactly the painting I would have chosen. Freud’s painting could be a close-up of the girl reading in Matisse’s painting. That same feeling is aroused. This woman is present to us while, simultaneously, being a thousand miles away. We are witness to her privacy without ever being able to know what she is thinking. We only know that we will never know. It is the same thing that Robert Hughes once wrote in The New York Review of Books about Freud’s portrait of Bacon from 1954. 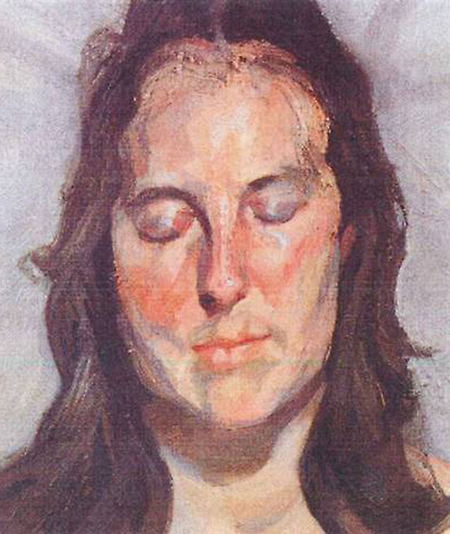 Hughes wrote that Freud had captured Bacon “in a moment between reflection and self-projection.” Hughes went on to say that Freud “has seen everything with such evenness while conveying the utter disjuncture between the artist’s gaze and the sitter’s lack of response.” That’s the Symbolist disjuncture. It’s the disjuncture that Matisse tried to capture, as well as Gauguin. It is the glimmer of what is fleeting and vague that Mallarmé was after in his Symbolist poetry. It is what Meyer de Haan was trying to convey in his self-portrait.